Transform your living area with the Collegedale chair and ottoman set. Its minimalist style makes it a wonderful addition to any contemporary home. Its exposed wood leg and small arm show off the chair's simple beauty. 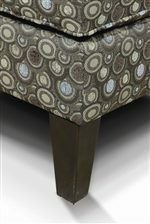 Pair with the ottoman for a comfortable and stylish footrest. This matching pair will create a simple and stylish look in your living room. The Collegedale Upholstered Chair & Ottoman by England at Virginia Furniture Market in the Rocky Mount, Roanoke, Lynchburg, Christiansburg, Blacksburg, Virginia area. Product availability may vary. Contact us for the most current availability on this product. 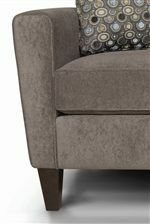 6204 Upholstered Chair 1 33" 35" 36"
6207 Upholstered Ottoman 1 26" 22" 18"
The Collegedale collection is a great option if you are looking for Contemporary furniture in the Rocky Mount, Roanoke, Lynchburg, Christiansburg, Blacksburg, Virginia area. Browse other items in the Collegedale collection from Virginia Furniture Market in the Rocky Mount, Roanoke, Lynchburg, Christiansburg, Blacksburg, Virginia area.